Maserati Granturismo MC Stradale | What Car? 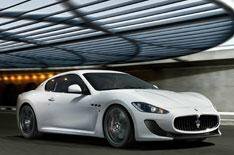 This is the Maserati Granturismo MC Stradale, Maserati's fastest, lightest and most powerful car to date. It is powered by the 4.7-litre V8 engine that's in the Granturismo S, uprated from 433bhp to 444bhp. Maserati hasn't revealed performance figures for the Granturismo MC Stradale, but given the increase in power and the weight loss - the car is said to be around 100kg lighter than the Granturismo S - the top speed will be more than 186mph. Despite the increase in performance, the MC Stradale's average fuel economy is the same as the S at 17.4mpg. The car has some styling changes that mark it out from the Granturismo S, including vents in front of and behind the front wheels, a boot spoiler, rear diffuser and redesigned twin exhausts. Sources say the car is likely to cost around 20% more than the Granturismo S, which would mean a price tag of around 106,000, albeit at today's 17.5% VAT rate. The car goes on sale next spring, however dealers are taking orders now.